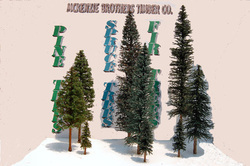 Custom Trees - McKenzie Brothers Timber Co. In addition to Tree Making Kits we sell Custom Made trees! Pine, Spruce, Fir, Redwood, Aspen and special order Deciduous type trees. These are samples of the different sizes of Aspens we sell. We provide about 6 different colors of leaf flake for Aspens and can combine combinations at your request. These deciduous type trees are made up using "Sage Brush armatures" and "Super Trees" for the upper branches and details. We then flock with foam or paper leaf flake for the desired texture and color you're looking for. These range from 4"-6" up to around 10"-12" tall and are more expensive as they are labor intensive, see our Pricing Guide for those details. Larger trees of this type could be ordered with arrangements and pricing to be determined at the point of sale. The trees picture here do not have their leaf flake added as yet, as they are waiting for the customer to determine weather I will use foam for a much larger fuller look, of any color they desire or paper leaf flake from over 10 different colors available through Scenery Express. If you have any questions about these just send me an email or call.